The only two certainties in life are death and taxes. In IT, you can add disasters to this short list of life’s universal anxieties. Ensuring disaster recovery reliability is critical to ensure your organisations enduring viability in your chosen marketplace. Regardless of the size of your budget, people power and level of IT acumen, you will experience application downtime at some point. Amazon’s recent east coast outage is testimony to the fact that even the best and brightest occasionally stumble. The irony is that while many organizations make significant investments in their disaster recovery (DR) capabilities, most have a mixed track record, at best, with meeting their recovery service level agreements (SLAs). As this chart from ESG illustrates, only 65% of business continuity (BC) and DR tests are deemed successful. DR testing can indeed be cumbersome. In addition to being time consuming, it can also be costly and fraught with risk. The risk of inadvertently taking down a production system during a DR drill is incentive enough to keep testing to a minimum. But what if there was a cost-effective way to do DR testing that mitigates risk and dramatically reduces the preparation work and the time required to test the recoverability of critical application services? Risk mitigation: Many IT decision makers have expressed concerns around their ability to meet end-user SLAs. By enabling organizations to rapidly spin-up virtual test labs that are completely isolated from production, businesses can safely test their application recoverability and proactively address any of their DR vulnerabilities. Improved ROI: In addition to on-demand DR testing, Veeam can also be utilized to instantly stand-up test/dev environments on a near real-time copy of production data to help accelerate application development cycles. This helps to improve time-to-market while delivering a higher return on your storage investments. 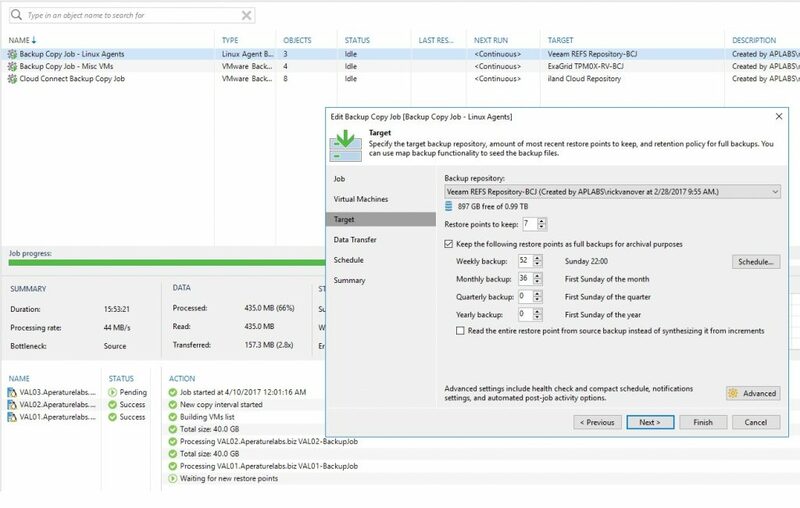 Maintain compliance: Veeam’s integration with modern storage enables organizations to achieve recovery time and point objectives (RTPO) of under 15 minutes for all applications and data. Imagine showing your IT auditor in real-time how quickly you can recover critical business services. For many firms, this capability alone would pay for itself many times over. Back when I was in school, 65% was considered a passing grade. In the business world, a 65% DR success grade is literally flirting with disaster. DR proficiency may require lots of practice but it also requires Availability software, like Veeam’s, that works hand-in-glove with your storage infrastructure to make application recoveries simpler, more predictable and less risky. Fighting ransomware has become a part of doing business today. Technology professionals around the world are advocating many ways to stay resilient. The most effective method is to have end-user training on how to handle and operate attachments and connectivity to the Internet. One other area to look is frequent endpoint devices: Laptops and PCs. Veeam has taken ransomware resiliency seriously for a while. 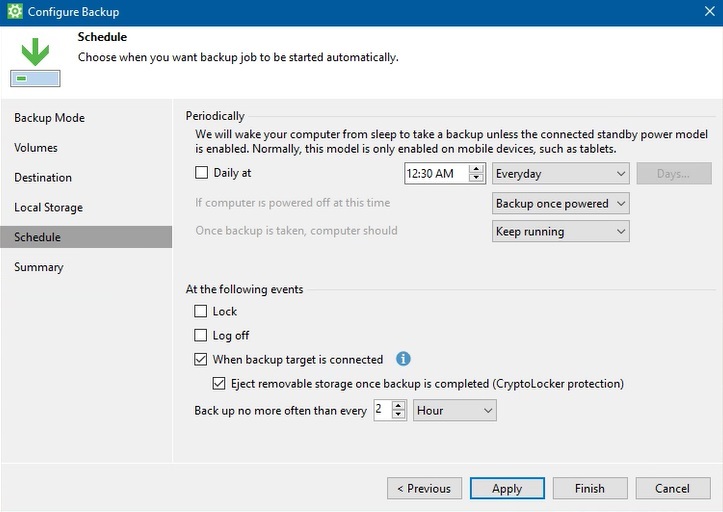 We’ve put out a number of posts such as early tips for some of the first attacks and some practical tips when using Veeam Backup & Replication. 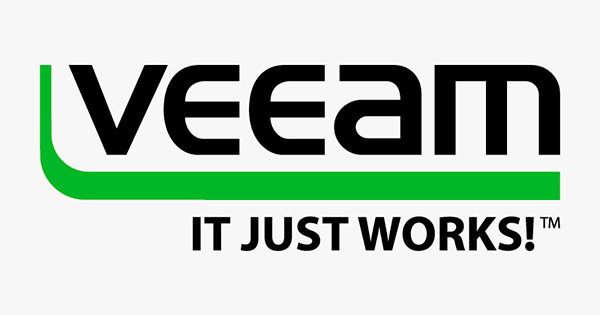 Now with Veeam Agent for Linux and Veeam Endpoint Backup FREE available as well as Veeam Agent for Microsoft Windows (coming VERY soon) as options for laptops and PCs, it’s time to take ransomware resiliency seriously on these devices. Before I go too far, it’s important to note that ransomware can exist on both Windows and Linux systems. Additionally, ransomware is not just a PC problem (see recent survey blogpost), as at Veeam we see it nearly every day in technical support for virtual machines. We’ll see more content coming for the virtual machine side of the approach for most resiliency, in this post I’ll focus on PCs and Laptops. Now, let’s talk about Microsoft operating systems and resiliency against ransomware when it comes to backups. Veeam Endpoint Backup FREE will soon be renamed to Veeam Agent for Microsoft Windows. Let’s explain this changing situation here briefly. 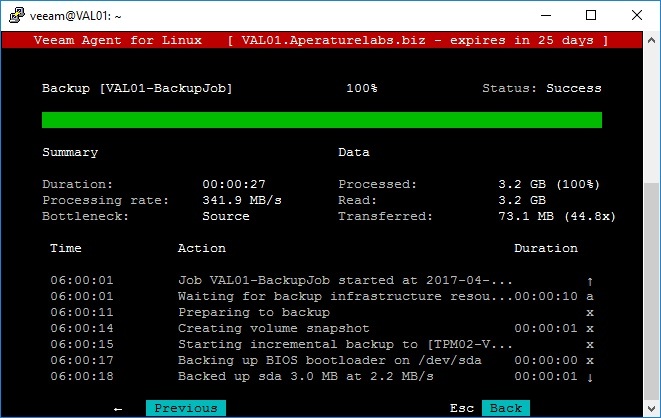 Veeam Endpoint Backup FREE was announced at VeeamON in 2014 and since it has been available, it has been downloaded over 1,000,000 times. From the start, it has always provided backup Availability for desktop and server-class Windows operating systems. However, it didn’t have the application-aware image processing support and technical support service. Veeam Agent for Microsoft Windows will introduce these key capabilities as well as many more. This simple option can indeed make a big difference. We even had a user share a situation where ransomware encrypted one’s backups. This underscores a need for completely offline backups or otherwise some form of an “air gap” between backup data and production systems. Thus, behave as if when you have ransomware in your organization the only real solution is to restore from backup after it is contained. There is a whole practice of inbound detection and prevention but if it gets in, backup is your only option. Having media eject offline is another mechanism that even with isolated PCs and laptops can have more Availability by having the backup storage offline. Availability in the ransomware era is a never-ending practice of diligence and configuration review. Additionally, the arsenal of threats will always become more sophisticated to meet our new defenses. Faced with the volume and rapid evolution of cyber threats these days, technology solution providers (TSPs) may find offering cyber security to be a daunting task. But with the right knowledge to inform your security decisions, and the right solutions and mitigation strategies in place, organizations like yours can keep customers ahead of the rushing malware tide. 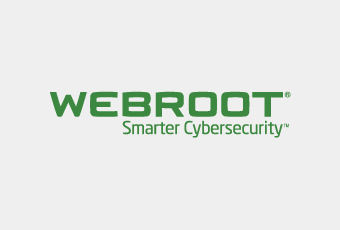 The Webroot team recently released the latest edition of their annual Threat Report, which gives crucial insight into the latest threat developments based on trends observed over the last year, the challenges they bring, and how to defeat them. Let’s review 2016’s Threat Report highlights. In the last few years, the biggest trend in malware and potentially unwanted applications (PUAs) observed by Webroot has been polymorphic executables. Polymorphic spyware, adware, and other attacks are generated by attackers so that each instance is unique in an effort to defeat traditional defense strategies. Traditional cyber security relies on signatures that detect one instance of malware delivered to a large number of people. It’s virtually useless for detecting a million unique malware instances as they are delivered to the same number of people. Signature-based approaches will never be fast enough to prevent polymorphic breaches. During 2016, approximately 94% of the malware and PUA executables observed by Webroot were only seen once, demonstrating how prevalent polymorphism is. Oddly enough, however, the percentage of malicious executables related to malware and PUAs has dropped significantly over the past 3 years, a 23% and 81% decline, respectively. While this decline in the volume of new malware encountered by Webroot customers is a decidedly positive trend, TSPs and their customers should continue to treat malware as a major threat. Approximately one in every 40 new executable file instances observed in 2016 was malware. These types of files are customized and often designed to target individuals, and cannot be stopped by traditional antimalware technologies. You’ve probably heard about at least one of the numerous ransomware attacks that have crippled hospitals and other institutions. According to the FBI, cyber criminals were expected to collect over $1 billion in ransoms during 2016. It’s quite likely that actual losses suffered were even higher, given the disruption of productivity and business continuity, as well as a general reluctance to report successful ransomware attacks. In its first week in February 2016, Locky infected over 400,000 victims, and has been estimated to have earned over $1 million a day since then. Throughout 2016, Locky evolved not only to use a wide variety delivery methods, but also to camouflage itself to avoid detection and to make analysis more difficult for security researchers. Locky shows no signs of slowing down, and is likely to be equally prolific in the coming year. The second important trend involves the frequent changes in the exploit kits ransomware authors use. As an example, most exploit kit ransomware in the first half of 2016 was distributed using Angler or Neutrino. By early June, Angler-based ransomware had virtually disappeared, as cybercriminals began switching to Neutrino. A few months later, Neutrino also disappeared. Toward the end of 2016, the most commonly used exploit kits were variants of Sundown and RIG, most of which support Locky. Despite having emerged in 2015, ransomware-as-a-service (RaaS) didn’t find its place in the ransomware world until 2016. RaaS enables cybercriminals with neither the resources nor the know-how to create their own ransomware and easily generate custom attacks. The original authors of the RaaS variant being used gets a cut of any paid ransoms. RaaS functions similarly to legitimate software, with frequent updates and utilities to help distributors get the most out of their service. The availability and ease of RaaS likely means even greater growth in ransomware incidents. The best defense is knowing your enemy. Download the complete 2017 Webroot Threat Report to get in-depth information on the trends we’ve explored above, as well as other crucial insights into phishing, URL, and mobile threats. The information above was provided by our service partner : Webroot. 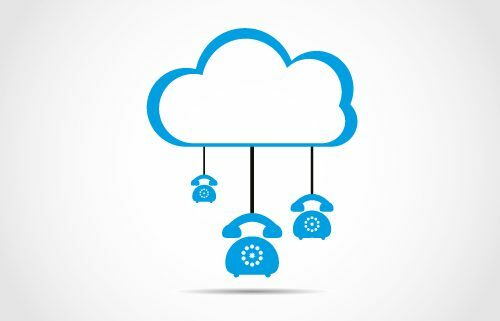 Not all things are created equal, and when considering a new phone system for your business, not all Cloud Based Managed VoIP Providers are the same. Before you sign a contract, there can be huge differences among Hosted VoIP Providers. Features – What features are most important to your business? Does your business need auto attendant, voicemail sent to an email, mobile twinning (sending calls to both a cell phone and desk phone at the same time)? Does the receptionist want to see who is on the phone? How about the ability of having “hot desking”, the ability of logging into anyone’s phone and have it appear as your own. This feature works great for medical practices who have rotating staff working the front desk. Don’t forget to ask office workers what features they could use. Equipment – What about the brand of phones that are used? Is the equipment proprietary or can it be used with other Managed VoIP services providers? Should you purchase the equipment or rent each handset and what are the advantages? Make sure you are getting quality VoIP phones from a quality manufacture, the last thing you want to happen is finding out the phones you bought are not good quality. Does each user on the system need a fancy phone with lots of features, most employees only use two or three features. Do you really need a cool looking conference room phone or will a basic handset do the trick? Many newer phones have excellent speaker phones, so a basic handset may work fine. A good provider should be able to offer multiple phone options as your business grows and expands. Pricing – Many providers offer confusing or different pricing options. Some offer unlimited options that may be simple to understand but you pay for features not needed. Another consideration is whether to rent or buy phones. With some customers it makes sense to buy, but what happens when the phone breaks, who is responsible? The cost of renting phones has dropped dramatically, however pricing and features vary greatly. Make sure you understand how the companies long distance calling is priced; contrary to what many believe, Hosted VoIP is not free phone service. Call Quality – This is where customers get burned and have poor VoIP call quality and get disappointed. It is important to know the difference between BYOY (Bring you own Bandwidth) compared to “managed VoIP” using a private MPLS data network. Some carriers provide an extra layer of call quality by using a managed router. Make sure you know the difference between managed and unmanaged services, there can be a big difference in call quality. Vendor Experience – This is one of the most important considerations when considering a Managed VoIP phone system. VoIP (Voice Over Internet Protocol) has been around for many years and many service providers are now selling Hosted VoIP via the internet, out of car trunks, basements and garages. It would be disastrous for a business if the phone company went out of business and had control of your phone numbers? Make sure you find out how long the Hosted PBX provider has been in business, how many customers they support and the types of customers. Disaster Recovery – It is very important to make sure you understand the providers network and how many POP’s (point-of-presence) they own and manage. Does the hosted PBX provider have built in intelligence that can determine when a business’s on-site phones stop working and can they re-rout calls to different numbers? How many network operation centers does the provider have, east and west coast only? Summary – Managed VoIP PBX offers advanced features previously only available to much larger business all for a great value. Hosted or Cloud PBX phone service compared to traditional solutions offers no-hassle phone service without ongoing maintenance, service contracts, costly hardware and onsite trip charges. While a hosted PBX offers customers ease of management; an onsite or Premise PBX is can still be a more cost efficient solution.